The UK’s first WCMX star Lily Rice took the world by storm with the viral video of her performing a backflip in her wheelchair. Now she’s trying to bring the sport to a wider audience up and down the country. Lily Rice is the coolest 14-year-old you will ever meet. Barely into her teens, Lily is already a star on the worldwide WCMX – Wheelchair Motocross – scene, as the second woman in the world, and the first in Europe and Britain, to land a backflip in her wheelchair. In her first foray into the WCMX World Championships, she picked up a silver medal in the women’s category. But what is WCMX? It’s an upcoming disability sport, combining aspects of skateboarding, scootering and BMX. Lily takes her wheelchair to the skatepark and carves up the bowls and ramps, like a young Tony Hawk. Aaron said the chair was in no fit state to ride and went one better – he got her a better chair. Before that, she had been zooming around her homemade ramp in an NHS standard wheelchair, and those just aren’t fit for purpose in the skatepark. Getting a chair is one of the primary barriers to entry in WCMX. You need a specialist chair to take the bumps and knocks that you’ll inevitably pick up in the skatepark. 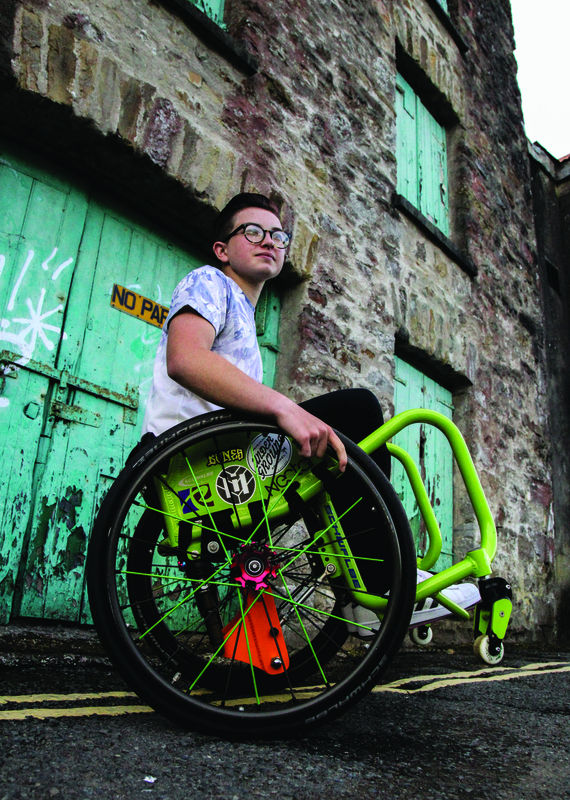 But now Lily’s partnered with Welsh sport wheelchair manufactures Roma Sport Wheelchairs, who produce chairs for the Welsh wheelchair rugby team, basketball, and tennis. She’s been working with them since Christmas to create a series of WCMX chairs for the UK market. One is an entry level chair for young kids which can take knocks and test the water, while the other is kitted out for professionals like Lily. Growing the sport is something Lily – and her whole family, because as her Dad says, it takes a team – is hugely invested in. In five years, they’d love to have enough people competing in the sport to have a national competition. Lily’s all too aware that the UK is just starting to recognise sports like skateboarding as a fun pastime, so that means that little money is being invested in creating skateparks around the country. There’s an ignorance to the benefits, socially and physically, to the presence of skateparks in communities. There are even fewer accessible skateparks – Europe just got its first, but it’s not in the UK. “In the skatepark, everyone is on wheels,” Lily said. 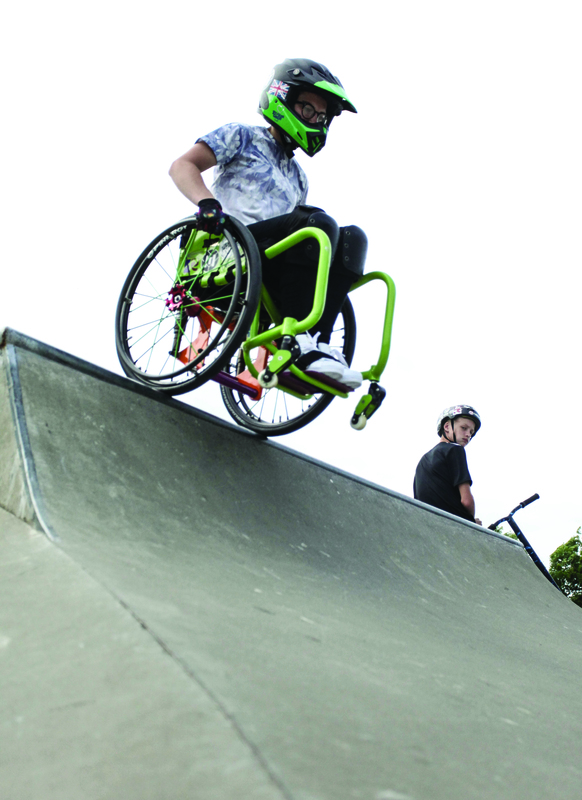 Adding WCMX into the mix in skateparks opens it up to inclusivity. Teenagers and young people just want to belong, and belonging to a group of skateboarders, scooters, BMXers and WCMXers gives these kids a place to belong. You’re all on wheels, in the skatepark, and riding together. Lily practices with her friends at the skatepark three times a week, but the Welsh weather doesn’t always accommodate for it, and recently, it’s been too hot to get out. For Lily, embracing WCMX also gave her confidence in her wheelchair. Starting secondary school, she loathed her wheelchair, and her Dad was painfully aware of it. She saw having to use the chair as returning to a massive stroller to be pushed around by others. Getting her WCMX wheelchair had a hugely positive effect on her mental health. “All of a sudden, you ride the wheelchair,” Mark pointed out. Not having Aaron around to guide her has meant Lily has cut her own path in the skate community, but she’s found it welcoming. At a recent event, legendary British BMXer Mark Webb towed Lily around an event, showing her around the skatepark and spending loads of time with her. Lily’s parents were astonished and grateful by the way everyone at the skatepark encouraged her. Lily’s national profile was raised again when she appeared in the music video for Tom Fletcher’s Christmas song, Afraid of Heights. The family were so excited to see the video, and Lily laughs when her Dad talks about how much he likes the video. “He cried at it!” she shouts. Mark was on night shift the day it came out and was so excited to see it that he couldn’t sleep. An actor portrays him in the video: “They typecast a dad because they needed someone who could reach those emotional highs,” he laughs. Now she’s reaching lofty heights, smashing records and brimming with talent and confidence. The only way from here for Lily Rice is up.